For too long, efforts to synthesize evolution and development have failed to build a united view of the origins and evolution of biological diversity. 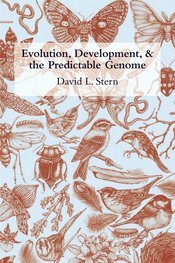 In this groundbreaking book, David Stern sets out to draw evolutionary biology and developmental biology together by cutting through the differences that divide the disciplines and by revealing their deeper similarities. He draws upon the insights of generations of evolutionary biologists and scores of developmental biologists to build a solid foundation for future investigation of the genetic and developmental causes of diversity. Along the way, and in plain English, he explicates many of the guiding principles of evolution, population genetics, and developmental biology. Each chapter offers a clear review of fundamental principles, together with thoughtprovoking ideas that will be tested only with data emerging from current and future studies. With the basic principles established, he then offers a new way of thinking about development—backwards—to clarify precisely how the mechanisms of development influence evolution. In the same spirit, he takes a fresh look at evolution in populations, arguing that population history influences precisely how developmental mechanisms evolve. Both Stern's new perspective on development and his reassessment of the role of populations leads to the surprising conclusion that the evolution of genomes appears to be predictable. Stern argues that developmental biology and evolutionary biology are intertwined: it is impossible to understand one of them fully without understanding the other. This book provides a clear and wide-ranging introduction to evolution and development for the basic reader; graduate students will be introduced to the cutting-edge of research in evolutionary developmental biology; and experts in evolution or development will receive both an uncomplicated introduction to the other discipline and an abundance of new, provocative ideas.